Moroccan Grilled Lamb Chops with Tahini Mint Pesto. Nothing screams dinner party like a succulent grilled rack of lamb. These Grilled Lamb Chops cut straight off the rack. I love dinner parties. What fun it is to relax with close friends and enjoy an impeccable meal and a glass, or two, of wine in the comfort of your own home. 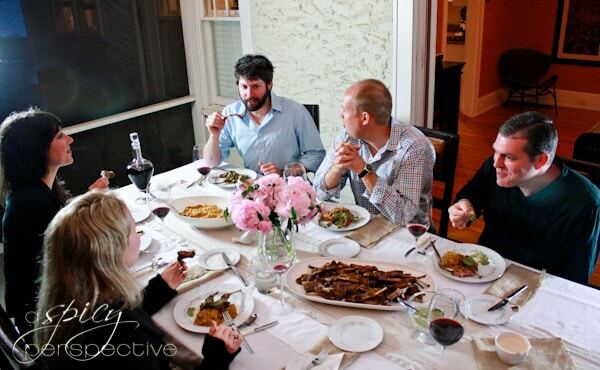 People often want to host a dinner party, but have a fearful aversion because they think they can’t pull it off. I’d like to put you at ease on three main concerns. 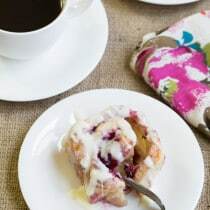 First off, a dinner party doesn’t have to be fancy. It can look and feel as casual as you like. Believe it or not, even with an abundance of food photography props, I don’t have a “fancy” set of anything, other than my grandma’s china. So that’s what I use. Here, I went with an eclectic spring feel using: my grandmother’s dishes, plain white table clothes, a linen table runner, a scrap of burlap for cloth napkins, my everyday silverware, white serving platters, a glass pitcher for a vase, and fresh peonies cut from my backyard. I did not run out and buy anything for my table setting; I just made it work. I also decided to pull my dining table out on our screened-in porch so everyone could enjoy the warm spring weather. That definitely added to the ambiance! It can be. Yet if you plan ahead, a dinner party doesn’t have to take more time than an average mid-week meal. I always set my table in the afternoon. Then I select dishes, with lots of flair, that aren’t very time consuming. 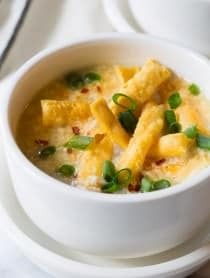 If you are thoughtful about your menu, you should be able to make a multi-course meal with appetizers and dessert, in about an hour. It’s all about creating a meal with intrigue, that doesn’t take all day to prepare. High quality does not equal hard to make. Ahem… Please, let me help you with that! When throwing a dinner party, I like to consider what produce is in season. Every dish tastes better when the produce used is at it’s peak. 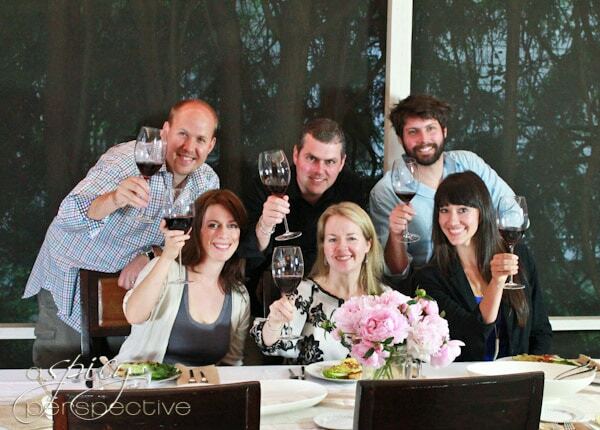 Last week I hosted a McCormick Gourmet Dinner Party for a few of my friends. We had an elegant meal including a Grilled Romaine and Orange Salad with Creole Buttermilk Dressing, Smoky Leek Risotto, and Moroccan Spiced Grilled Lamb Chops with Mint Pesto. It was utterly divine, and not a lot of effort. After our appetizer in the kitchen, we headed to the table for a salad course with charred romaine, blistering grilled oranges, avocado and bacon. The salad was dressed with a rich and zesty Creole Buttermilk Dressing made with McCormick Creole Jambalaya Seasoning Mix. Even with grilled oranges and bacon on the plate, the dressing was the highlight of the dish! 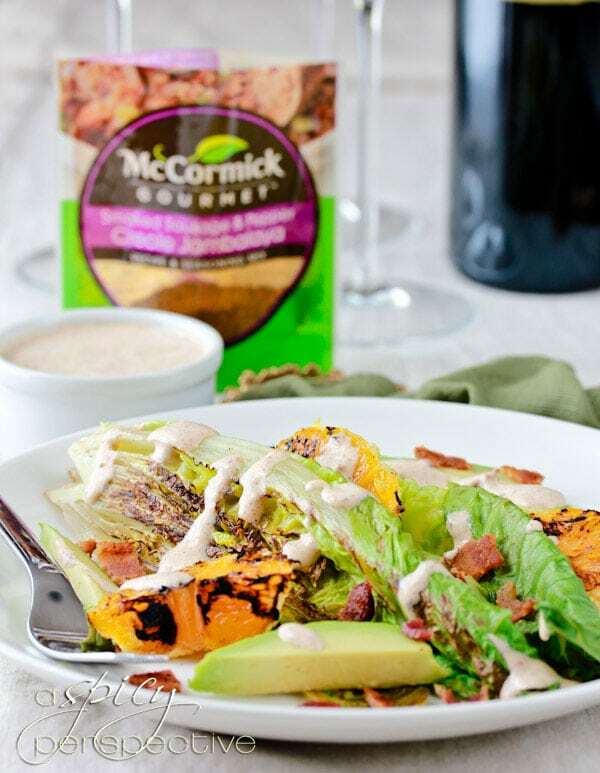 Click here for the Grilled Romaine Salad with Creole Buttermilk Dressing Recipe. 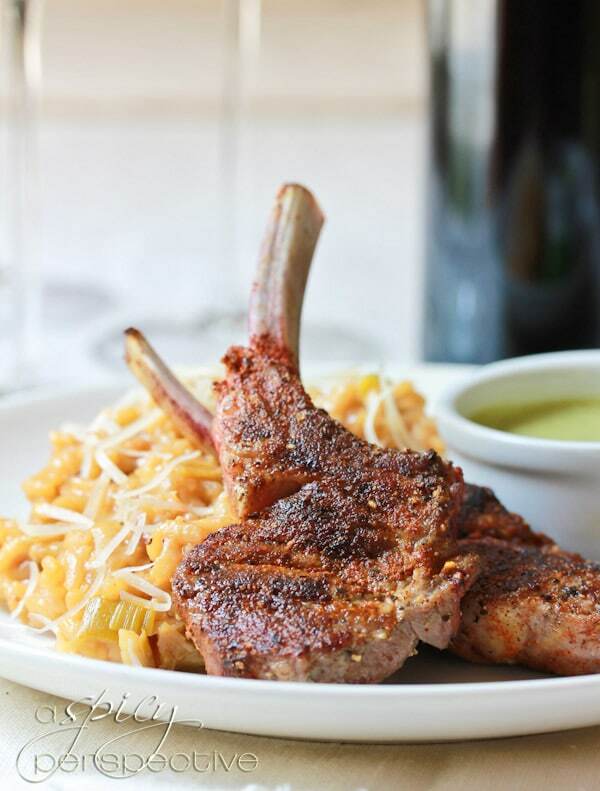 We followed our salad course with Smoky Leek Risotto and Moroccan-style grilled rack of lamb. The risotto was ultra creamy with fresh leek, sauteed to release it’s flavor, and McCormick Roasted Ground Cumin and Cuban Seasoning. The bright and earthy flavors made a perfect platform for the star of the show, Grilled Lamb Chops. 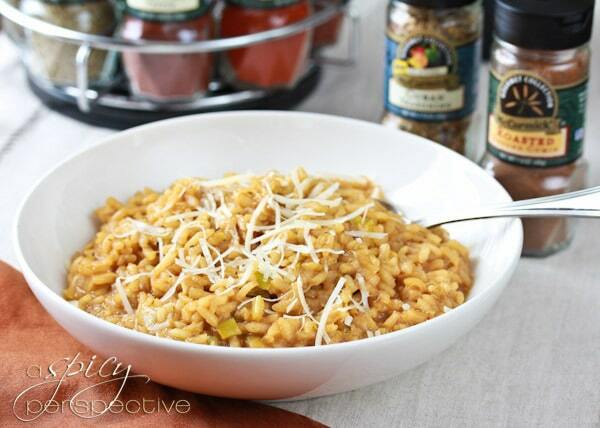 You can get the Smoky Leek Risotto Recipe here. And finally, our main course was a spicy grilled rack of lamb, cut into lamb chops for quick cooking. These juicy little chops only take two minutes to grill (for medium-rare) and look utterly opulent sitting high on your plate. I dusted the lamb chops with McCormick Moroccan Seasoning before grilling, then quickly blended a mint pesto with nutty tahini, garlic, McCormick Roasted Cumin and fresh mint leaves. The combination of the spicy grilled lamb chops and the cooling mint pesto was divine. Moroccan-style grilled rack of lamb with a creamy tahini and mint sauce. Cut the rack of lamb into chops and salt the pepper on both sides. Then dust both sides with Moroccan Seasoning. Grill 1 minute per side for medium-rare. Cover the grilled rack of lamb with foil and allow to rest for at least 5 minutes before serving. Meanwhile, place all the ingredients for the mint pesto in the blender. Puree until smooth. It should be thick, yet just pourable. 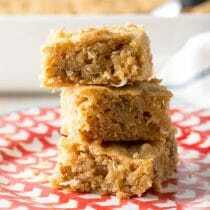 If it is too thick, add another tablespoon of water. Salt to taste. Serve the grilled lamb chops with the mint pesto drizzled over the top or on the side for dipping. Disclosure: This post is sponsored by McCormick Gourmet Spices. All opinions are my own. mmm looks tasty. 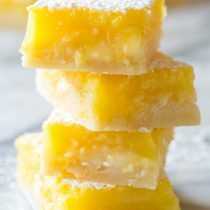 Always looking for new recipes, thanks for sharing. 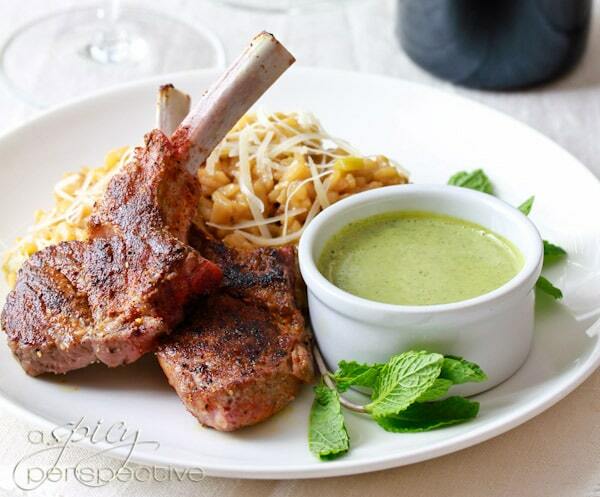 Lovee the idea of the mint pesto with these lamb chops – much better than the old school mint jelly. 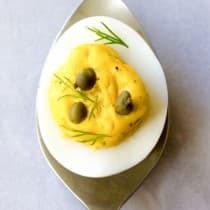 Lovely recipe and now I want to come to one of your dinners! I love lamb chops. Boy do I. This looks amazing. I want a plate full. Nice display on the table and nice food. Can we have some bits ? What a beautiful table and meal. This sounds like so much fun. I love entertaining. These flavors sound so good! The first thing I noticed (other than the lamb of course) was the incredible trees you are graced with in your yard! Ahhhh, something a desert rat would lust for. I am excited to try McCormick’s Moroccan spice and thanks for the fun tips! Those lamb chops are gorgeous! I love how chops are so quick to prepare, as opposed to a whole leg or a crown roast (the latter two of which I’ve never done). Beautiful peonies, and love the table setting. I agree, use what you already have, and guests like feeling relaxed instead of formal anyway. I had to laugh at your post – the whole lack of fancy dinnerware and table set up is definitely a reason I haven’t put on a dinner party. I haven’t gone more formal than a very informal bbq. Your dinner party looked like tons of fun. Each course looked so colorful and packed with flavor! I LOVE lamb and I love lamb accompanied by mint sauce – I have never seen morroccan-style lamb or a tahini mint sauce, so yo really put a unique spin on this! BTW, the flowers on the table are gorgeous!! Gorgeous party, you make it sound super easy! I was looking for a lamb dish and the combination of spices in your pesto sounds delicious. I’m going to give this a try. Beautiful! My husband would love these lamb chops. What a fun event Sommer. 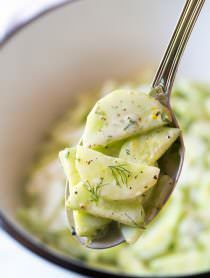 Love all the photos – beautiful tablescape – and that mint pesto sounds fantastic! What a lovely dinner party and menu. 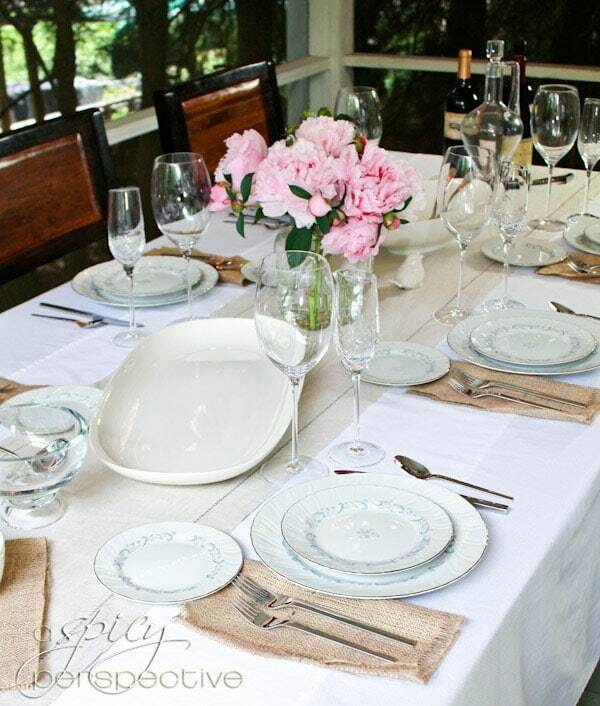 I love your approach with getting ready for a dinner party and love the table setting you used. Sommer, your dinner party turned out beautiful! Your lamb looks so beautifully prepared and the table is flawless. Seems like it was a fun evening with friends! 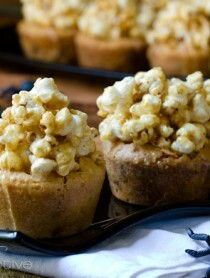 I also hosted one thanks to McCormick and posted about it today! Beautiful, Sommer!! I love the grilled romaine! It looks awesome!! That is definitely one dinner party! Belongs in a magazine!